There is not one single rule for businesses on Twitter as all businesses are different in terms of the products they are selling and the market they are selling to. Some local networks are highly developed on Twitter and these are fine for small local businesses with a local market but different market strategies work for different businesses in different ways and we should remain open minded in the way that we approach Twitter. I have heard many people say that Twitter isn’t about selling. I agree, it isn’t about selling - but it is about sales. It is all about taking a different approach to selling. If you are going to be asked to spend a great deal of your time managing your Twitter account effectively then you should at least be able to see a return for your efforts. You shouldn't underestimate the commitment of time required to make this work for you. Some companies choose to outsource this element of marketing in much the same way they outsource PR or digital marketing but either way Twitter can be a valuable resource for your business and can drive measurable results. It is all about finding a way that will work for you. These 10 tips should at least point you in the right direction and I hope you will find them helpful. This will affect how you use Twitter and is fundamental to what you say in your bio, what image you use for your avatar and the content of your tweets. Some slightly bigger businesses can benefit from having more than one person managing their twitter account to share the commitment and time required to make Twitter effective for their business and in these cases, a logo or image representing the company could be more effective than a photograph of someone’s face. 2. Build your Twitter Bio from possible search terms people will use for your business including your different services and include your phone number and location. 3. Establish a Twitter marketing plan – just because you build it, it doesn’t mean people will come. 4. Research your competitors on Twitter. 5. Research your market on Twitter and start building your network. Identify people who are possible clients for your business. They may be people that are following your competitors, people who have indicated an interest in something on their bio or in their tweets. For example, I work with a hotel that has a gin bar, a fairly unique selling point and one which means that the hotel can be marketed as a destination to people nationally who are interested in gin. By finding, following and interacting with these people we have been able to alert them to the fact that the hotel has a gin bar and have been able to quickly build a network of potential hotel guests in this way. There will always be businesses with who you share your target market. Not necessarily competitors but complimentary businesses who may be selling similar lifestyle products for example. In one example of another hotel client that I’ve been working with, our follower network was largely local and we were looking to promote heavily discounted weekend rates. We approached another hotel with a local network in a different town and we agreed to promote each other’s offers on a reciprocal basis. It is very easy on Twitter to find yourself pulled in a different direction to the one that you decided on when you started. Be consistent and clear in what you are saying and who you are saying this to. I have seen many a company drawn into local networks when their business has more national aspirations for example. Choose the services that you want to promote and choose the market you want to promote this product to. In my experience the more niche the service or product, the more successfully this can be sold on Twitter. 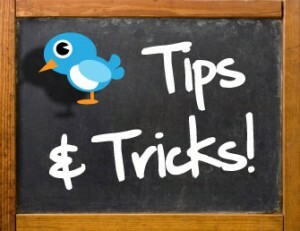 Make a list of terms that you search regularly on Twitter. To my mind, the word ‘recommend’ is the most important search term you could possibly use. There are always tweets asking Twitter if anyone can ‘recommend’ a service or product. These are all requests from potential clients who may be interested in buying your services or your product and you should reply to them whether they are following you or not. Twitter is not just about broadcasting, it is as much if not more about listening and responding and this is something that many people forget. Twitter has many so called ‘experts’ and zealots telling you what you should do and how you should do it. Avoid them if you can. You know your business better than anyone and so you should take all advice with a large spoonful of salt and find a way that works for you and for your business. There are many free resources and online publications available that will help you to build your knowledge in this area.